Tasmania symphony : the legend of Moinee ; Sinfonia da Pacifica / Tasmania Symphony. 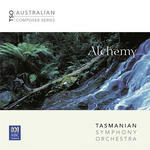 Alchemy / Tasmanian Symphony Orchestra. Serious music in Australia: I. Sydney. Contents note: Allegro -- Lento tranquillo -- Allegro giocoso. After undergoing brain surgery, Glanville-Hicks retired to her home in Sydney where Charles Amirkhanian recorded a rare interview with the composer, in May of 1986. During their conversation, of which extensive segments are included in this program, they touched upon a wide range of topics, including her stint as a New York City music critic, her travels, and her music. Book: Discovery : teaching kit No. 1, 1993 / presented by Melbourne Symphony [and] Victorian Arts Centre Art-Ed Programme. 14 Aug 2015: at Ulster Orchestra & BBC Radio 3 (Ulster Hall (Belfast, UK)). Featuring Ulster Orchestra, David Porcelijn. 29 Mar 2015: at Tasmanian Youth Orchestra (Princess Theatre, Launceston). Featuring Tasmanian Youth Orchestra, Greg Stephens. 28 Mar 2015: at Tasmanian Youth Orchestra (Burnie Town Hall Theatre). Featuring Tasmanian Youth Orchestra, Greg Stephens.